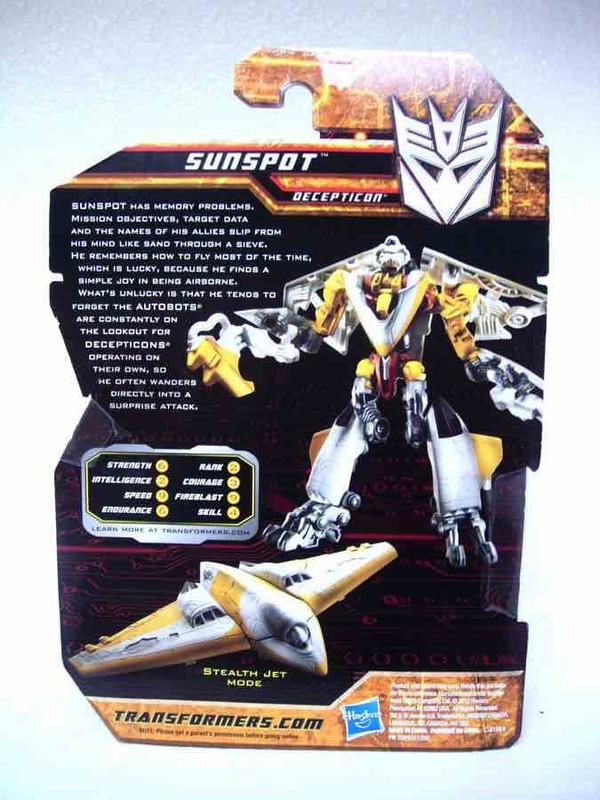 The Scout-class toy (previously basic-class toy) are clearly the red-headed stepchild of the Transformers franchise, as the sub-$10 price point has been steadily creeping up to the point where these smaller toys like Sunspot cost the same as their larger, deluxe counterparts at Wal-Mart several months out of the year. While not a bad toy, retail logic dictates you can't charge the same price for a big toy than you do for the smaller, entry-level ones. 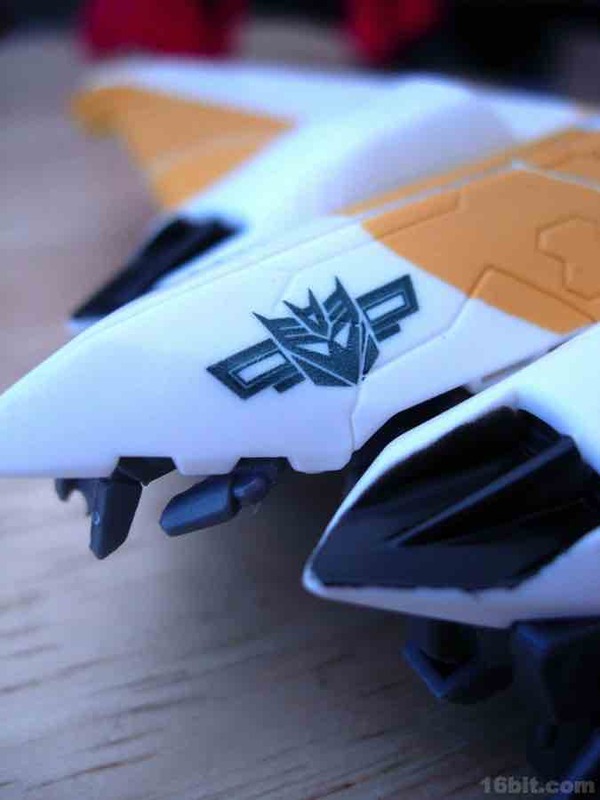 Hasbro's trying to axe this segment, but before they do they're making a few last molds and squeezing out a few more repaints like this one. EDIT: This is speculation-- based on new Scout-sized toys of the past year, the seeming turnover I've seen at retail, the frequency of new product, and a couple of leaked toy images, it feels like this segment is getting the short shrift. We'll know for sure over the next month as Toy Fair confirms whatever it is we're going to buy between now and Comic-Con 2011. 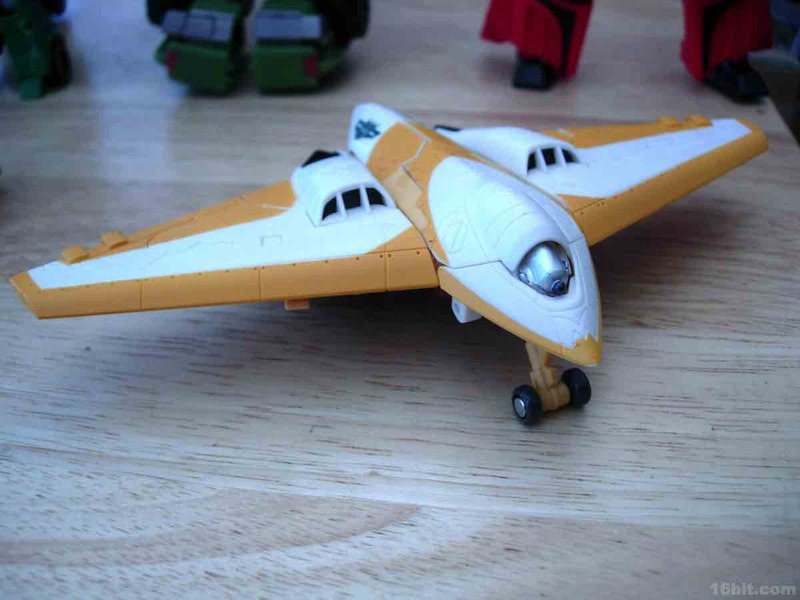 This redeco of Revenge of the Fallen Skystalker takes a cue from Sunstorm, a Japanese-exclusive orange Starscream repaint which has been made into a number of toys. The unique coloring renders this figure mostly white, with some silver and very dark grey here and there. The vehicle is a nice-looking aircraft, with retractable front landing gear and, on the whole, no play value to speak of. You can pick it up and make it fly around with your hand, or you can pull down the feet for a quasi-gerwalk mode if you're into such things. These little vehicles rarely have more going on for them than rolling wheels. It's also worth noting that the vehicle is designed to combine with Revenge of the Fallen Mindwipe and also Reveal the Shield Strafe, neither of which match the color scheme for this blindingly bright figure. 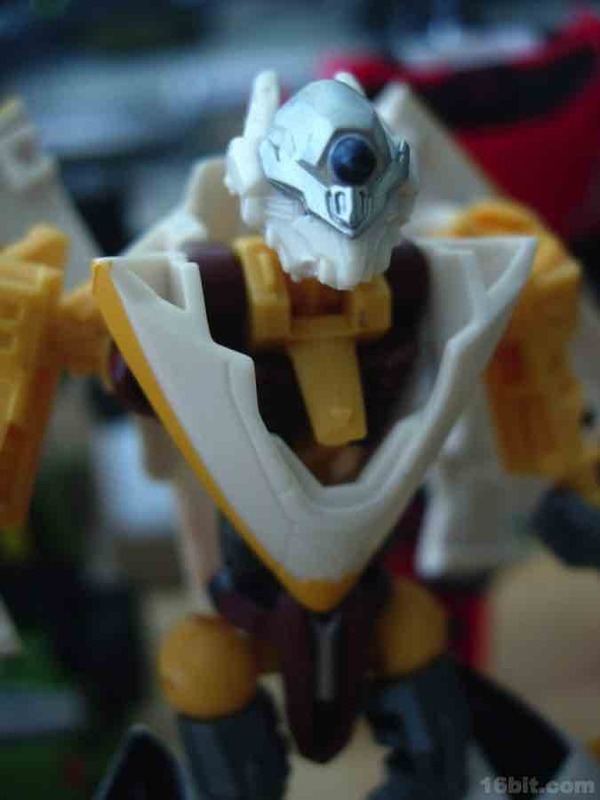 The roughly 4-inch tall robot has a large eye on his head and, if you squint, the sculpt may remind you slightly of the Animated character Lugnut. (Now there's a redeco of this mold I could get behind-- Lugnut drones!) The massive wingspan makes the toy feel more animal-like, as do the claws he has for feet. Speaking of those feet, that's one big downer right there-- they're spring-loaded for reasons I can't fathom. So if you pick up the figure, the claws snap together, and you have to spread them apart manually before putting the figure down on a table or a shelf to stand. It seems more like a design flaw, or a lost action feature. 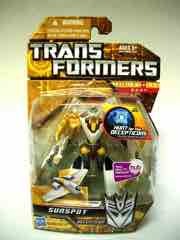 It's just annoying and really not a great gimmick, plus it added a little cost to the toy too. 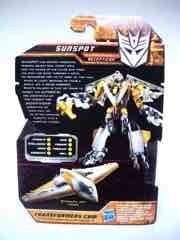 Unlike most Scouts, Sunspot does not come unarmed-- there are two claw weapons that pop off his wings. 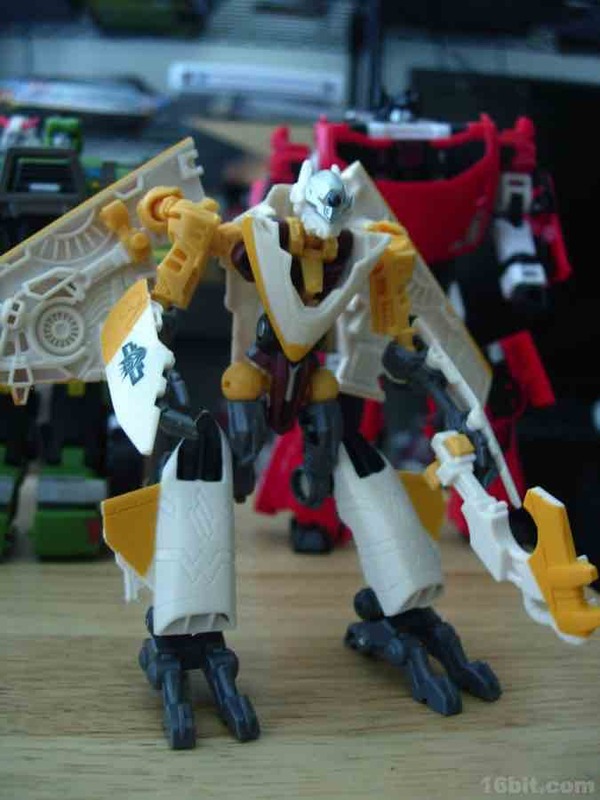 These can be plugged into his palms with pegs, or they can attach to his forearms with the same c-clamp mechanism you've no doubt seen on several Transformers since late 2009 or early 2010. Or, if you prefer, you can just leave them plugged into the wings-- that looks good too. They are also a little stiff, and slightly tricky to pull out once you get them aligned in there just right. It's a nice toy if you can get it with a coupon or on sale, but for $9 it doesn't hold a candle to similarly priced deluxe toys. This toy was released just before Thunderwing, Skullgrin, Jazz, and Tracks-- all of which are significantly more advanced and impressive playthings. I wouldn't say it's a waste, but of the toys I've shelled out money for over the past year it's one of the least interesting Transformers. Again, it's not bad, it's just that so many of the other releases were better that this one stands out as being merely acceptable instead of great, plus when you factor in the price it might not be worth the effort to pick it up.